Transparency Market Research (TMR) has published a new report titled, “Cerebral Oximeters Market - Global Industry Analysis, Size, Share, Growth, Trends, and Forecast, 2018–2026”. 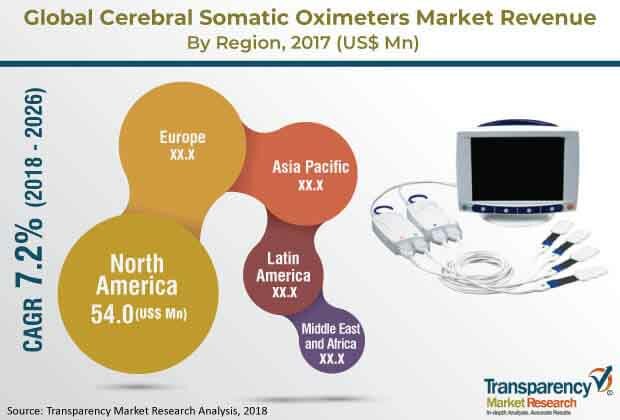 According to the report, the global cerebral oximeters market was valued at US$ 134.2 Mn in 2018 and is projected to expand at a CAGR of 7.2% from 2018 to 2026. Inclination toward minimally invasive procedures, wide usage of cerebral oximeters for hemostasis, and rise in acceptance of cerebral oximeters are anticipated to boost the growth of the global market from 2018 to 2026. The principle of cerebral somatic oximeter is based on near-infrared spectroscopy (NIRS). These devices are increasingly popular during pre and post-operative cardiac, vascular, and other surgeries. It is a non-invasive technology which can monitor regional oxygen saturation and overall hemostasis of the body. Efficient patient monitoring can help prevent adverse events. The global population is aging rapidly. According to the WHO, nearly 2 billion people will be aged 60 years and above by 2050, accounting for around 16.7% of the global population. The population in developed countries such as Japan, the U.S., and countries in Western Europe is aging at a faster rate. This is attributed to better health care infrastructure & polices and adoption of techniques new endoscopic techniques. Additionally, access to various diagnostic and treatment services has improved in these regions in the past few years. This, in turn, has increased the life expectancy of the overall population. This will gradually increase demand for cerebral oximeters products. Neurological diseases and brain trauma such as hypoxic-ischemic encephalopathy (HIE) are caused due to less supply of oxygen to the brain. Hence, increase in incidence of cerebral hypoxia is anticipated to drive demand for cerebral oximeters. According to estimates, HIE occurs in about 2 to 9 per 1,000 live births and causes significant brain damage and impairment. Increase in incidence of neurological diseases is likely to drive demand for cerebral oximeters products. Manufacturers are constantly expanding their product portfolios through increase in investments in R&D for production of technologically advanced and efficient cerebral oximeters. For instance, Nonin Medical's SenSmart Model X-100 Universal oximetry system is a dual-parameter medical device that analyzes pulse and regional oximetry values. Emerging economics such as India, China, Brazil, Malaysia, and other countries in developing regions in Asia Pacific, Middle East & Africa, and Latin America present significant opportunities in the health care market. For instance, the Government of India in its Union Budget for 2017–2018 increased the total health care expenditure from 1.97% to 2.27% of total union budget. North America is anticipated to dominate the global cerebral oximeters market during the forecast period. Advancements in current techniques, demand for products, and increase in usage of cerebral oximeters in hemostasis and non-hemostasis applications are projected to drive the market in the region in the next few years. Rise in awareness and educational campaigns are attributed to North America’s dominance of the global market during the forecast period. The U.S. Government is also undertaking initiatives to reduce the incidence and prevalence of cardiovascular diseases by spreading awareness about these diseases. Rise in per capita income and rapid increase in the geriatric population are the key factors expected to augment the market in the U.S. in the near future. Favorable reimbursement policies is another key factor likely to fuel the growth of the market in the country during the forecast period. Additionally, mergers and acquisitions by key players present significant opportunities in the cerebral oximeters market in the U.S.
Cerebral hypoxia is one of the most common causes of secondary brain injury during neurosurgical procedures. Demand for non-invasive procedures for brain monitoring is anticipated rise in the next few years. Usage of near infrared spectroscopy (NIRS) has resulted in reduction of perioperative neurologic complications. Adoption of minimally invasive surgeries has increased significantly due to advantages such as less post-operative pain, less blood loss, reduced hospital stay, and faster recovery.